This is my last post for Clear Dollar Stamps - I want to thank them for inviting me to work with their digital images this month! 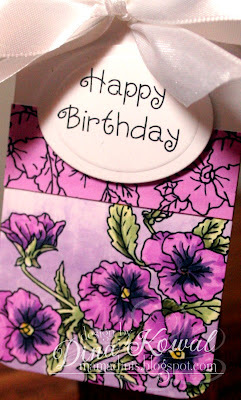 I thought I'd try something a little different for today, and use the Pansy digital image as an embellishment on a diecut tag. I colored the image using Touch Twin Markers. The horizontal band on the tag is the same image, with the panel colored using a marker to match. I used a Bow-Easy to tie my double bow, and left one tail pretty long - I tucked that tail through the hole in my tag, wrapped it around the neck of a bottle of bath gel, then tucked it back out the hole. What a final post, Dina! Coloration amazin'! Liking your combos leading spring with summer not far behind in neighborly gift sharing, May Day, Graduation, birthdays, Mothers or Fathers Days and some weddings or anniversaries to celebrate along the way. Anyone say B a b y?!! We're looking at a yellow-blue-pink announcement by very totally elated set of grandparents in waiting! Ahh, yes! mighty fine crafting. mt23stamperatyahoo Keep Looking Up!